Take one capsule after the evening meal. For optimum efficacy, the supplement should be taken regularly for 1-2 months. The best results are noticeable when the product is taken just after a meal when the stomach shows heightened activity. 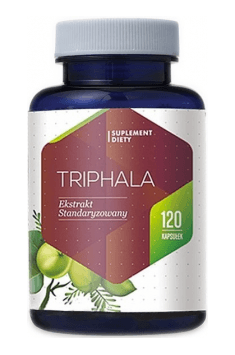 Triphala will improve digestive processes. The supplement cannot be used by pregnant and breastfeeding women without prior medical consultation. Terminalia chebula – also known as haritaki, a tree which provides raw material used widely in Ayurveda and Tibetan medicine and has many health benefits. Haritaki means “the one that takes away diseases”. This raw material is a fruit with tannins, triterpenoid glycosides, anthraquinones and flavonoids, among others, rutin and quercetin. Terminalia Chebula is a traditional remedy for digestive problems by influencing positively digestive processes and intestinal function. Due to the content of tannins, haritaki has an antibacterial effect (among others, on Helicobacter pylori, Salmonella sp. and Staphylococcus aureus) and mild laxative properties and stimulates cleansing processes in the intestines. The raw material reduces constipation, bloating, irritation caused by the presence of parasites and inflammation of the mucosa of the digestive tract. Haritaki fruits help normalise the lipid profile – contributes to a decrease in levels of total cholesterol, LDL and VDL cholesterol, free fatty acids and triacylglycerols and an increase in levels of cholesterol. Its extracts show also antioxidant activity and support healthy liver function. Along with amla and bibhitaki, haritaki is an ingredient of the popular formulation triphala, an adaptogen which promotes digestive health and helps reduce inflammation. Formulas from Terminalia chebula may be used effectively in overweight and obesity, digestive problems, lower energy levels, fatigue and to support the body’s immunity. Terminalia bellirica – also known as Bibhitaki or Barro, is a tropical tree species native to Asia. The fruit of this plant has a long tradition in Ayurvedic medicine. This raw material contains, among others, tannins, ellagic, gallic and chebulinic acid, sterols (beta-sitosterol), lignans and mannitol. Bibhitaki fruits have a positive and normalising effect on digestive function – they stimulate intestinal motility, reduce bloating (flatulence), have hepatoprotective properties and increase appetite. Due to the content of tannins, which have an astringent effect on mucosa, terminalia fruits are helpful in diarrhoea. The raw material is also widely used for respiratory diseases – asthma, cough, cold and laryngitis. It demonstrates mucolytic properties, thereby dissolving mucus in the respiratory tract and facilitating expectoration. Bibhitaki fruits have antihypertensive, antibacterial, anti-inflammatory and antioxidant properties, aid in the maintenance of optimal blood cholesterol levels and influence positively sugar balance. Extracts from this raw material are reported to inhibit the development of atherosclerotic plaque. Terminalia bellirica supports neurological function, consequently calming the body and reducing nervous tension. Along with amla and haritaki, bibhitaki has been a component of triphala, an Ayurvedic formulation which has a tonic and cleansing effect on the digestive system, thereby promoting its function and weight loss. Tannins are chemical compounds that differ from each other structure. Soluble in water found in the leaves of a walnut and tea, oak bark (tannin). They are used as complementary medicines in eczema, burns, herpes, chronic bleeding and injuries, creating a mucosal gelatinous clot and although limiting life activities of cells, it also protects the cells located in the following layers from infections. In a sports used in the treatment of open wounds and edemas (anti-edematous and anti-inflammatory). Oak bark tan- tannin, should be used as directed. Taking larger doses can cause damage to the capillary and the formation of necrotic foci in the liver.